New and innovative health care delivery and the payment infrastructure to support those reforms must be built on the interoperable exchange of health data. Interoperable health data exchange requires that systems and devices be able to exchange data and interpret that shared data. 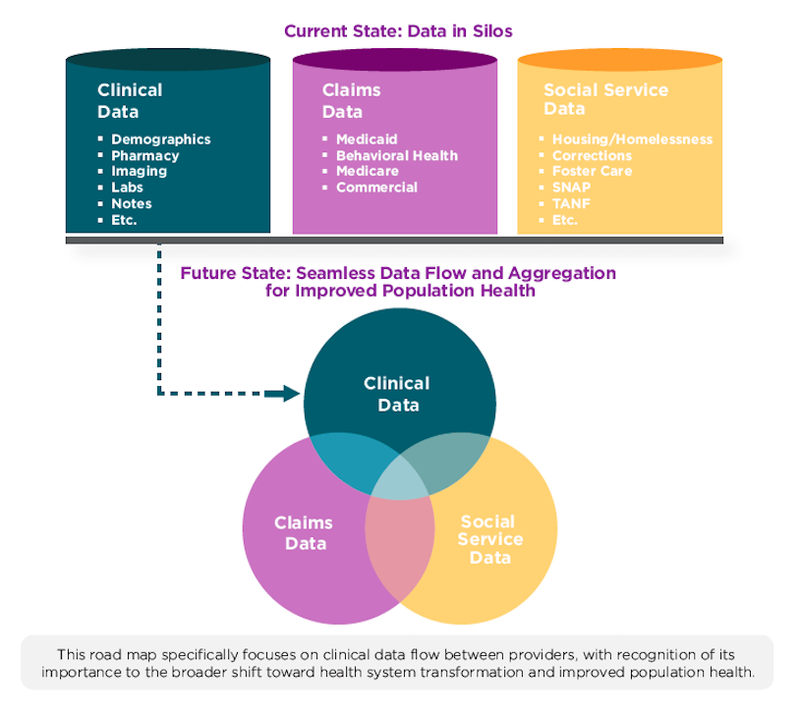 The ability to share and use health information within and across systems plays an important role in achieving the triple aim of improving health, improving health care, and reducing costs. However, despite recent and significant investment in health information technology, particularly electronic medical record systems, the exchange of data has not kept pace with the development of technology. Without interoperable data, health systems are not appropriately equipped to deliver high-quality, coordinated care to patients. States are committed to improving delivery of high quality and coordinated patient care by increasing interoperability between providers while carefully ensuring the privacy of patients. Exchange of clinical health information is critical to ensuring that providers have the best information possible when making decisions about patient care, minimizing repetition and errors, ensuring high-quality transitions of care and lowering costs. The United States has experienced significant advancements in medical diagnostics and treatments for complex health problems in recent years; however, health care still lags far behind other sectors of the economy in the exchange of information to improve efficiency. Due to a variety of legal and market-based barriers, exchange of clinical health information between providers often does not occur, or occurs in a manner that does not allow for meaningful use of data to support optimal patient care. "Not only has the NGA published its road map, it has begun assisting several states in executing the road map’s recommendations. NGA will issue a report on these efforts next year. We look forward to continued collaboration with NGA and state governments, policymakers, and private sector health care leaders"
The road map – “Getting the Right Information to the Right Health Care Providers at the Right Time: A Road Map for States to Improve Health Information Flow Between Providers” – was developed to activate governors and their senior state leaders to drive forward policies that support the seamless flow of clinical patient health care information between providers while protecting patient privacy, as a step toward nationwide interoperability.